Make sure to follow these rules when giving rides in New Orleans, and to keep an eye on your email for important news and updates from Lyft. If you're a driver anywhere else in Louisiana, visit this page instead. If you're applying to become a driver in New Orleans, check out the application steps. 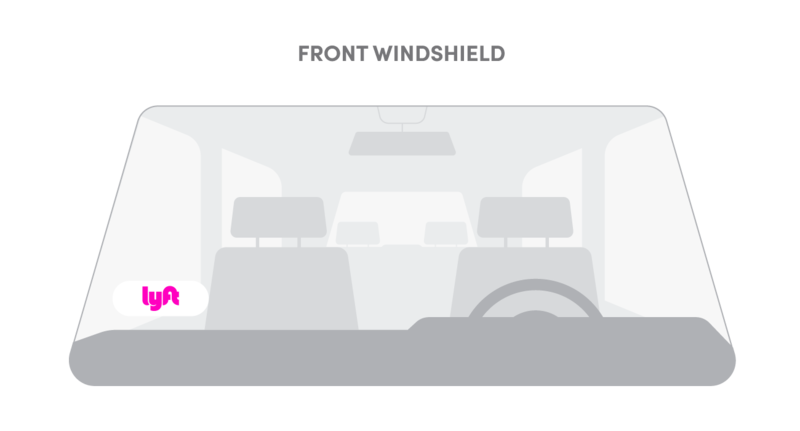 Drivers in New Orleans are required to display the Lyft emblem while in driver mode. Refer to the image above for where to place your Lyft emblem. Follow all parking laws: New Orleans Lyft drivers, as with all Lyft drivers, are prohibited from stopping, standing, parking, loading or unloading passengers in a travel lane or in an officially designated bus or taxi stop. In addition to Lyft's mandatory break requirement, New Orleans regulations require that drivers spend no more than 12 consecutive hours in driver mode within a 24-hour period. If you experience an accident, an issue which threatens your personal safety, or receive a citation, make sure to take the appropriate steps to protect yourself and get to a safe place. If necessary, call the authorities by dialing 911 or your local non-emergency assistance line, and then call our Critical Response Line by clicking the "Call Me" button on this page. We're available 24 hours a day, 7 days a week. If you have feedback to report to the Ground Transportation Bureau, call 504-658-7170 or email gtb@nola.gov. For more information regarding TNC rules in NOLA, click here. We have a strict zero tolerance policy for drivers — more info here. If you have any inquiries regarding the zero tolerance policy, reach out to us. We have a strict anti-discrimination policy. Drivers are encouraged to read more here. Drivers may not refuse to take any passenger who has requested to be dropped off within ten miles outside of the city limits once the request has been accepted. The city of New Orleans Department of Safety and Permits randomly selects drivers every quarter for random drug testing. If you do not complete, or pass the drug test, the City of New Orleans will not permit you to drive with Lyft for one year. In addition, the City of New Orleans requires you to take a drug test within 24 hours if you are involved in a traffic accident while driving with Lyft. If you do not complete, or pass the drug test, the City of New Orleans will not permit you to drive with Lyft for one year. At the testing center, tell them that you are a Lyft driver and will need to take the same drug test as taxi drivers. If you have been selected, you will need to visit an approved testing center within ten days of being notified by Lyft. See below for our suggested and approved sites. If you have any questions, please reach out directly to the Ground Transportation Bureau at 504-658-7170 or email gtb@nola.gov. If you’re interested in providing wheelchair-accessible rides, and have a vehicle which can accommodate wheelchairs, let us know. Drivers on the Lyft platform are required to maintain current documents (license, registration, insurance, brake tag sticker). Always update your documents via the Dashboard when they expire. If you're already a driver in a different state, and you're moving to New Orleans, send us a message with the following info. If you're moving to a different city in Louisiana, follow the steps here instead. Please note, your vehicle must be from 2011 or newer to qualify for Lyft in New Orleans. Moving from New Orleans to a different state? Find your new market here to see what steps you'll need to take.